As it grows increasingly bonkers, this atmospheric thriller also becomes more and more entertaining, gleefully piling on the freak-out moments. 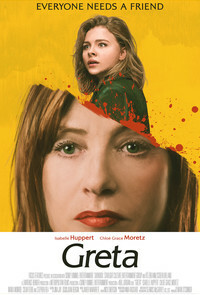 It may be flatly ridiculous on several levels, but the lead performances from Isabelle Huppert and Chloe Grace Moretz keep the screws turning, while director Neil Jordan has a great time inducing goosebumps as well as a few good laughs along the way. In New York, Frances (Moretz) is struggling to get over her mother's untimely death with the help of a waitressing job and her no-nonsense friend Erica (Monroe), with whom she shares a palatial Brooklyn loft. When Frances finds a handbag on the Subway, she decides to deliver it to its owner, discovering that Greta (Huppert) is a lonely widow whose daughter has moved to Paris. These two sad women become friends until Frances makes a chilling discovery: Greta seems to have done this before, and may not be as harmless as she looks. It's enjoyable to watch the script play with genre tropes. For example, when Frances helps Greta adopt a dog from the shelter, it's clear that this won't go well. When Frances' father (Feore) hires a private investigator (Rhea), and he begins snooping around Greta's house, the audience feels one step ahead of him. Jordan orchestrates all of this with slick sophistication, layering classical music over insinuating imagery to evoke both bump-in-the-dark horror and Hitchcock-style murderous mayhem. Huppert is, of course, perfect for this kind of role, batting her luminous eyes innocently while also conveying a deep sense of nefarious nastiness. And she keeps Greta tightly contained even in the film's more gonzo sequences, even breaking into a little dance at a particularly gruesome moment. Moretz is solid as the frightened young woman opposite her. She has little to do but act terrified, but she's effective at drawing the audience into her perspective, experiencing the fear through her eyes rather than relying on cheap cinematic tricks. That said, Jordan still has fun with visual language, playing with camera angles, lighting, music and sound to build a gurgling sense of impending horror. Many of the plot's twists and turns are deeply preposterous, but the actors' deadpan performances and Jordan's arch approach to pulling the viewer right into the nightmare combine to create a movie that feels at the same time both silly and scary. In other words, you'll jump in your seat, then laugh about it.